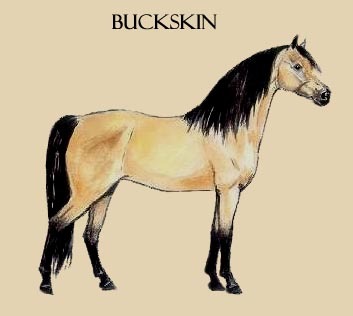 Buckskin is the result of one cream gene on a bay or brown horse. The cream gene, in its heterozygous state, only affects red hair, so the black hair on a horse with one cream gene is left undiluted. 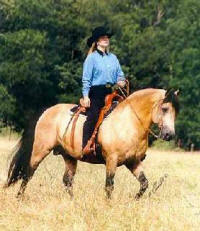 Buckskins can vary in shade from very pale buttermilk through a very sooty, dark brown color. Buckskins with the sooty modifier (which causes darker shading starting along the topline of the horse) often have heavy dappling and a dorsal stripe. 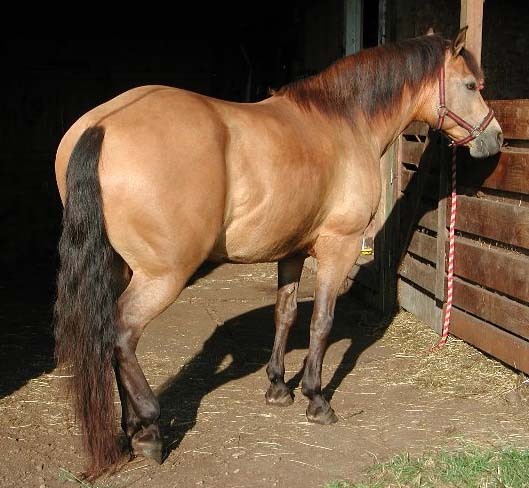 Buckskins can be mistaken for bays if they are more red than gold, for duns if they have a dorsal, or for seal browns if they are very dark. 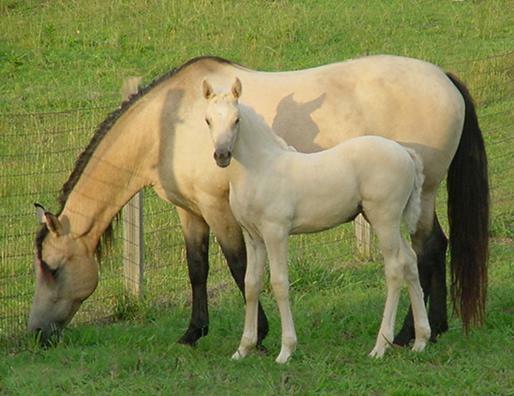 Buckskins will have at least one cream dilute parent. 4. Cotton Hill Daisy (Amigo Mick X Daisette), 1949 palomino mare. The source of Cotton Hill Daisy's cream gene is unknown, but may have come from her granddam Madonna, a black daughter of Go Hawk (black, no apparent cream dilute lines) and Red Ruby (who may have been some sort of cream dilute, misregistered as chestnut- her dam, Ruby, is also the maternal great grand-dam of Night Tide). Cotton Hill Daisy's color line is represented by horses from Sunup Neptune lines. 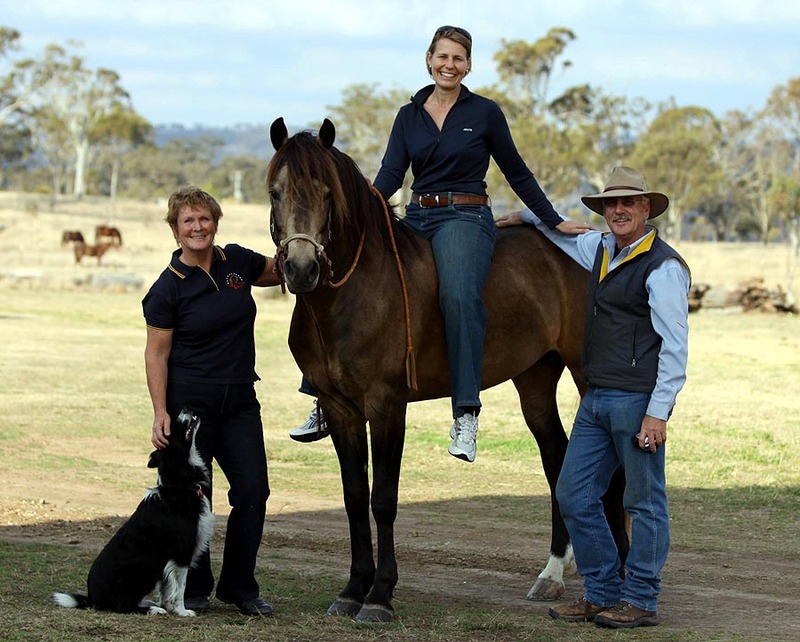 RANCHBOSS CORTEZ (Primavera Valdez x Telura's Black Gold), 1999 buckskin stallion owned by Wilga Park Morgans, Queensland, Australia. Shown with Cortez are (L-R) Kathy Lyons, Christine Maroni (on Cortez), and Greg Lyons. SC ISLAND CENTAVO (Truewest Gold Peso x Caduceus Margaux), 1998 brown buckskin gelding. 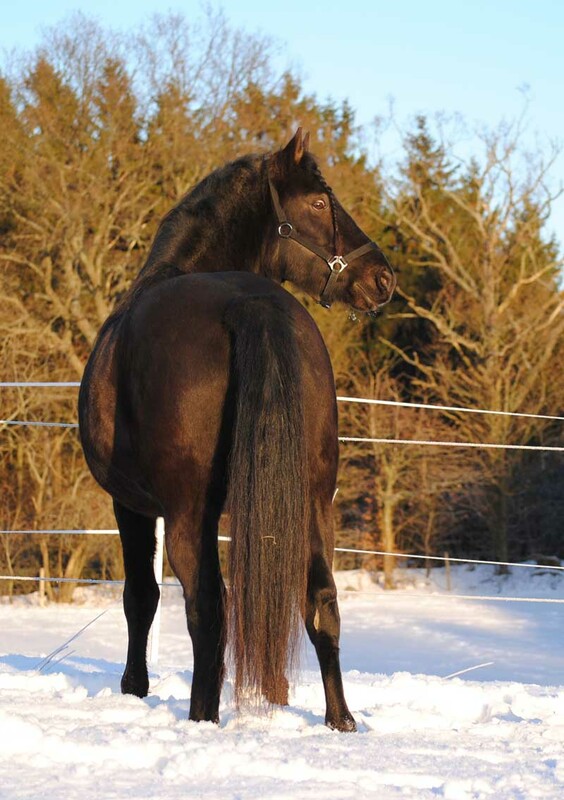 Owned by Sara D. Alvrud, Escania Morgans, Sweden. 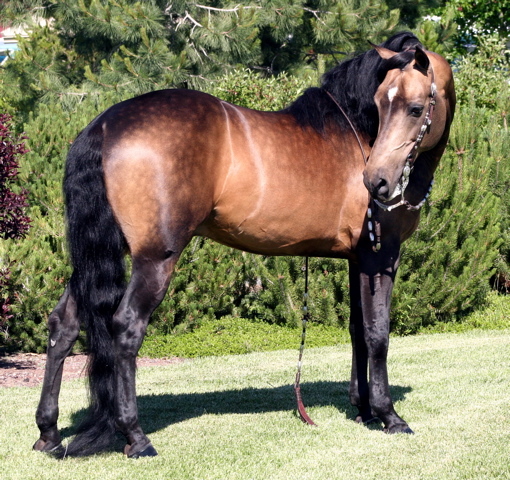 "Smoky" is an extremely dark buckskin, which some might mistake for black, brown or smoky black. He tested EE Aa Crcr. 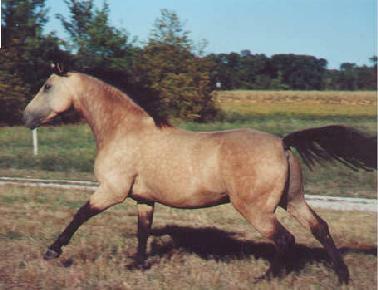 The late LBF YUKON GOLD (Edelweiss Magic Man x Saint Bernadette), 1997 buckskin gelding, owned and driven by Linda Kalman. 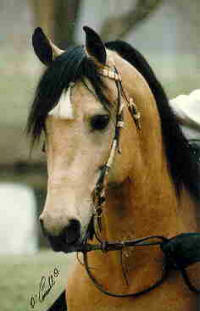 THE BRONZE PROMISE (UVM Promise x Cascade Cadence), 1994 buckskin stallion owned by Erin Silver. Photo courtesy of Kathy DeFazio. 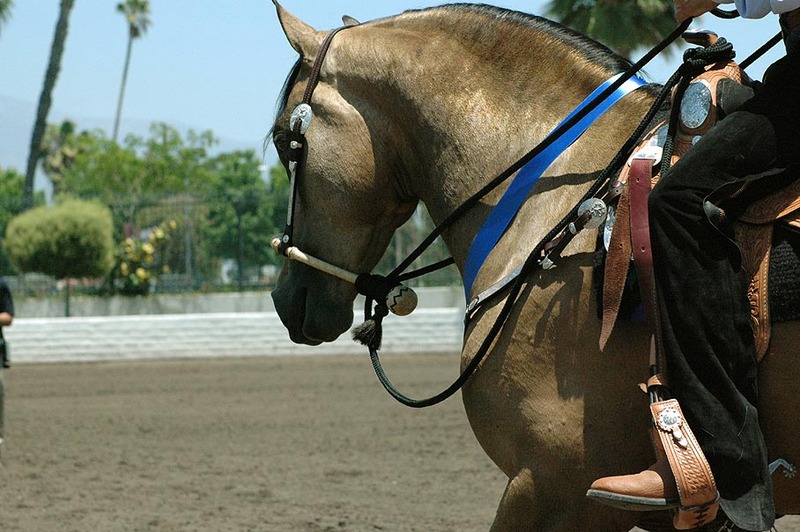 RFF WILD FLOWER (TFM The Midas Touch x Raintree Red Roses), 2001 buckskin mare, ridden by Kelly Kraegel Varner at the 2008 Morgan Grand National. Photo by Ken Martin. 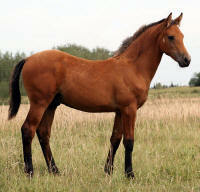 HMSTD JONESY (HMSTD Rum Runner x Two J Miss Mariah) 2009 buckskin colt owned by John Thompson. What an interesting fellow! Jonesy's color looks more bay than buckskin and at birth, his mane was mostly red, as was the top of his tail. 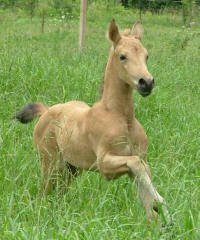 No matter how "bay" he may look, we can be sure he is buckskin because his sire is a perlino. 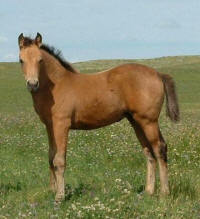 Third picture at age 4 months, with the foal coat shed out. Photos by Jonesy's breeder, Janine Welsh. DEVINE MOUNTAIN ECHO (Devine Spirit of Hope x Devine Catalina), 2005 brown-based (tested/confirmed) buckskin mare owned by Chris Holm, Devine Morgans. Pictured on the left shortly after birth and on the right at age 3. 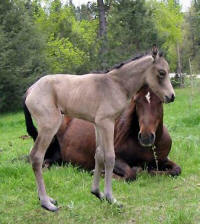 Darker buckskins are often born quite light, as Echo was, only turning dark after the foal shed. 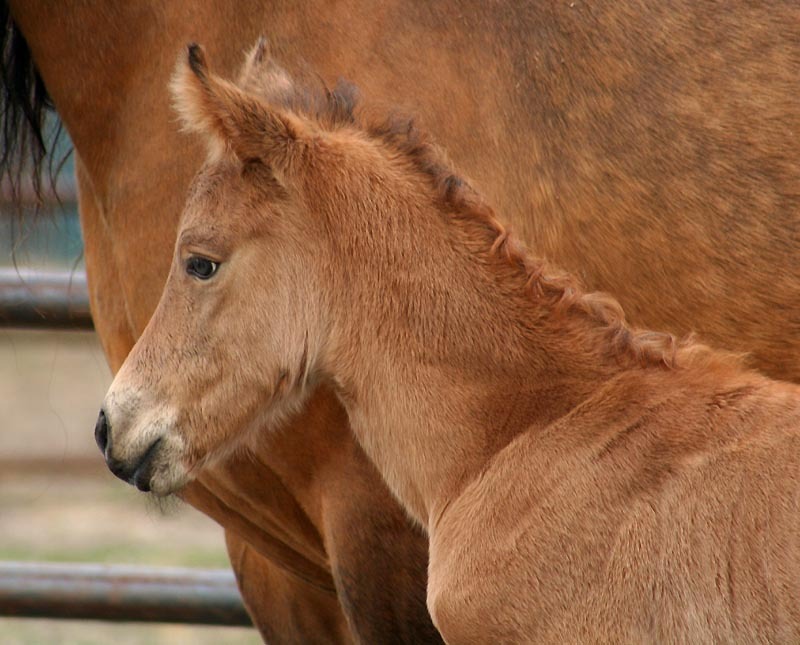 A hint of the dark shade to come can be seen around and under the foal's eyes, as darker buckskin foals often have near-black shading there. 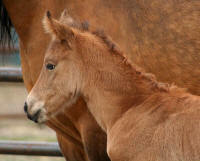 AMMOLITE MAPLE SUGAR (PHPM Lord's Gift of Gold x Snowdancer's Sugar n Spice), 2008 brown-based buckskin mare (pictured as a suckling) with her brown dam SNOWDANCER'S SUGAR N SPICE (TL Royal Rainmaker x Snowdancer's Solsticerain). Not all brown-based foals are born as light as Devine Mountain Echo (pictured above). Bay-based foals are generally not born with this much black on their legs; their black leg points appear at foal shed. 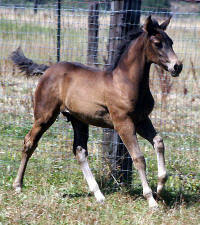 Brown based foals often have fairly extensive black on their legs even before the foal shed, however. We know this filly is also buckskin because her sire is a perlino. 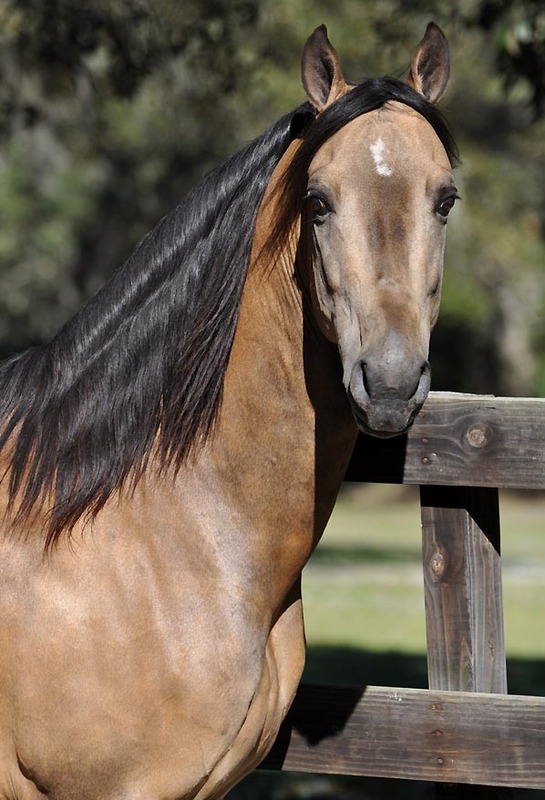 Cream simply does not have much of an effect on a mostly black horse, which is why many brown buckskins look brown-only and were mistaken for browns in the past. Photo courtesy of Sue Dixon. MOSSROSE TRIUMPHANT (Sunup Neptune x Jacque's Lor-don-Lin), 2001 buckskin stallion owned by Rosita Hammar, UK. Photo by John Hayes. DREAM CATCHER JACOPO (BDM Border Ryder x Dream Catcher Desiree), 2009 buckskin colt owned by Dream Catcher Morgans. This colt's sire is a cremello, so we know he has a cream gene. 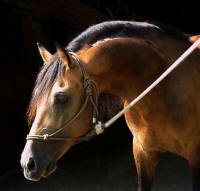 He is most likely a brown-based buckskin, as he is so dark. MLB CAPO DI CAPO (The Last Don x Aquila's Sure Prize), 2004 buckskin stallion bred and photographed by Laurie Faust. 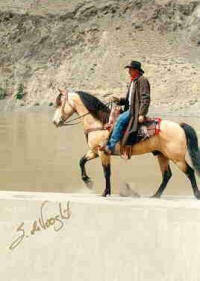 He won the 2013 World Champion Western Pleasure title, the first colorful Morgan ever to do so. To read more about "Cha Cha", check out this article by Laura Behning. 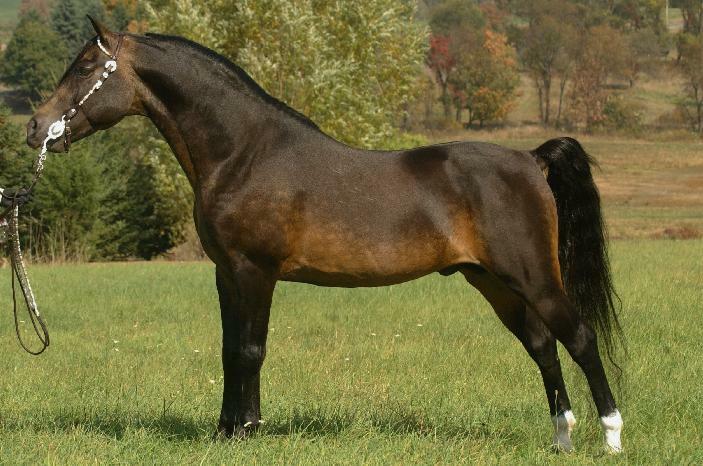 JUSTIN HIDDEN GOLD (Mossrose Triumphant X Taproot Bluebell), 2005 dark buckskin stallion formerly owned by Diana Jasica, Off Border Hill, Belgium. Photo by Claudia Irmer. The late ABI'S NANCY OAK (left), (Adanac Redd Oak X Adanac Abigail), 1989 brown mare with her 2004 brown buckskin daughter UCM LAURA SECORD (by Amberfield's Vanilla Ice, cremello). Most people would not look at Laura and think she was a buckskin. 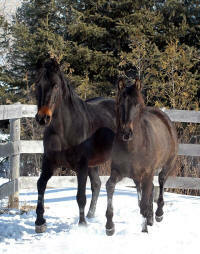 But since one cream gene has little effect on black, and brown horses are mostly black, this is the result. She is slightly lighter with a more golden undertone than her dam, and seeing them side by side makes this interesting comparison possible. Photo by Mary Freeman. R2 KOOTER CAT (LJ Morning Reveille, buckskin X Bold Attraction, brown), 1999 buckskin gelding owned by Vicki Wells of Oakville, WA. Kooter shows a very prominent dorsal stripe, but it is not the result of the dun gene, as he does not have a dun parent. 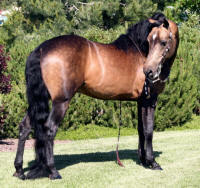 Any color horse may have a dorsal stripe or other dun-like markings. AZKACHINA SMOKI (Robbi Sue's Ragtime X Ragtime Kachina), 2003 buckskin stallion owned by Roberta Brown. Photo by Caprice Soltice. NVS MIDAS (Sunup Neptune X Raintresa Ecstacy), 1997 buckskin stallion owned by Lisa Horning of NVS Morgans in Lincoln, CA. 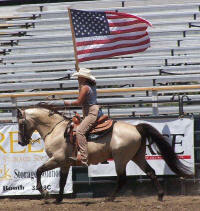 Midas and Lisa are shown here presenting the colors at the 2006 Horse Expo. 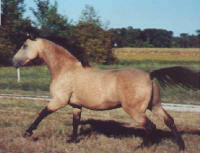 ROBBI SUE'S CASSANOVA (Equinox Brigham X Robbi Sue's Misalert), 1995 brown buckskin stallion owned by Laura Bunke. Because brown horses are mostly black in color, there is very little non-black pigment for the cream gene to dilute. 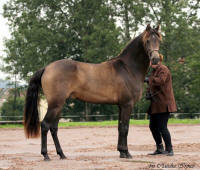 As a result, when the cream gene is present on a brown base a very dark buckskin is created. These are often mistaken for a non-dilute. 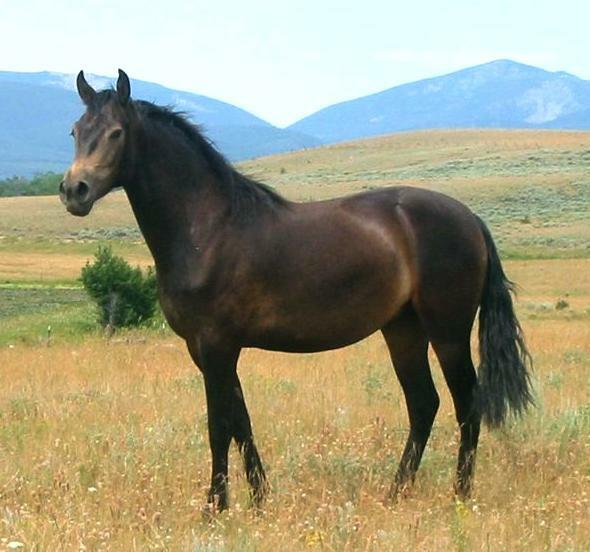 Some brown buckskins are even darker than this horse. 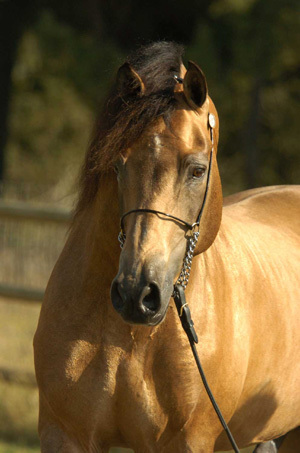 BAYMOUNT'S ASHLEY (Blacksaddle Starbuck X TOV Christina Caminos), 2002 buckskin mare owned by Baymount Morgans, Red Bluff, CA. 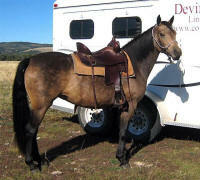 DEVINE GUNSMOKE (Blacksaddle Starbuck X Devine Golly Gee Whiz), 2003 brown buckskin gelding. 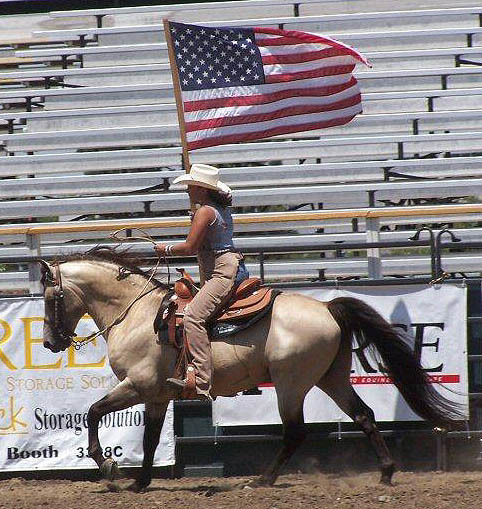 Gunsmoke was bred by Devine Morgans, Lincoln, MT and is owned by Janice and Darryl Bosley. ROBBI SUE'S MR. ALERT (Glamorgan Vista X Robbi Sue's Misalert), 1987 buckskin stallion owned by Lauren LaRue, Potter Valley, CA. 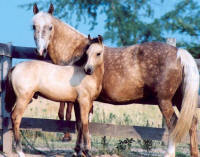 KENNEBEC TOPAZ (Medomak Cavalier X Kennebec Opal), 1992 buckskin mare owned by Laura Behning, Covington GA, with her 2004 palomino filly Coral Forest (by World's Edge Goldoak). 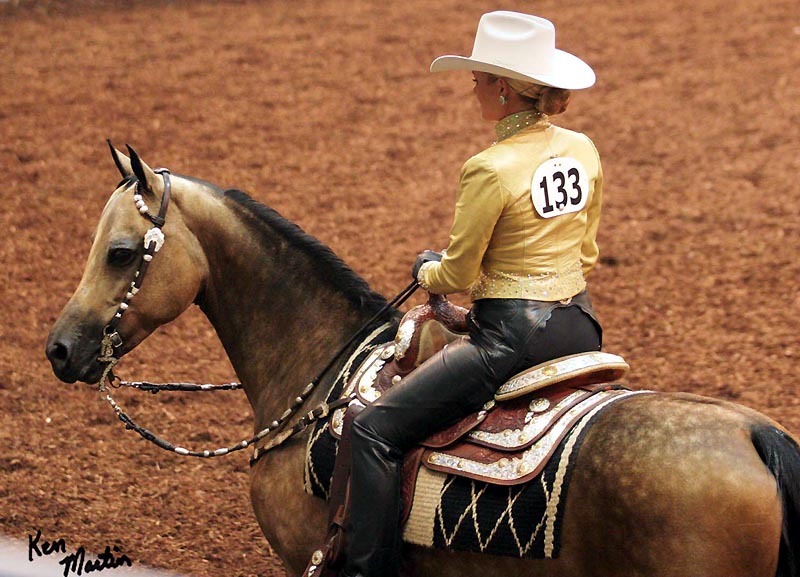 This shade of buckskin is often called "buttermilk". To see more of Coral and Topaz, go here. The late PRAIRIE RUN LIZ-T (PRM Thunderbird X Prairie Run Fantisy), 1993 buckskin mare owned by Patty Clark, Promised Land Farm. 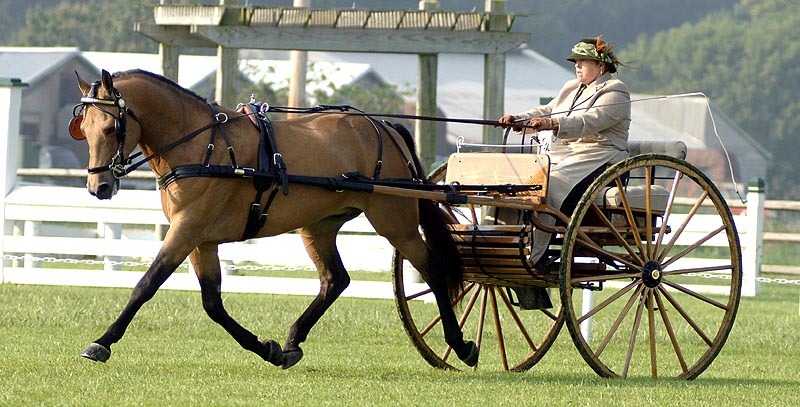 She is shown here in a pleasure driving class with Patty's son Andres Guardiola. 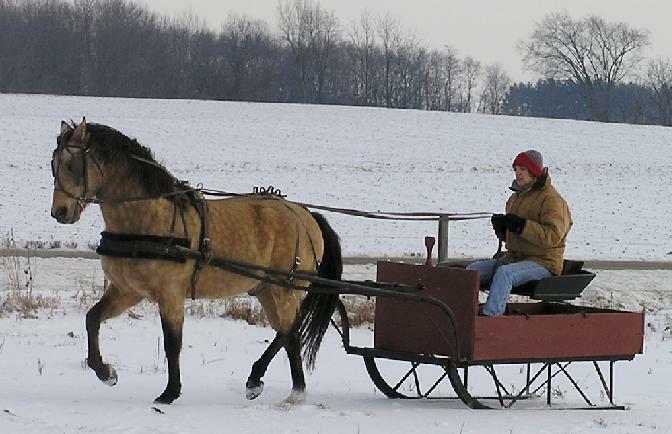 EDGEFIELD SUN GOLD (Sunup Neptune x Mill Creek Chica Caliente), 1997 buckskin stallion owned and driven by Charlene Cook, Goshen, IN. You can see more of "Sonny" here. 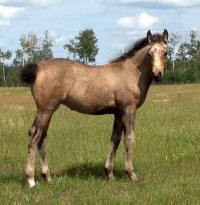 TL BRONZE FASCINATION (Snowdancer's Silver Night X TL Breezy's Topaz), 2004 dark buckskin mare (pictured as a weanling) owned by Grace Aten. "Fanny" is a dark, bronzy shade of buckskin. 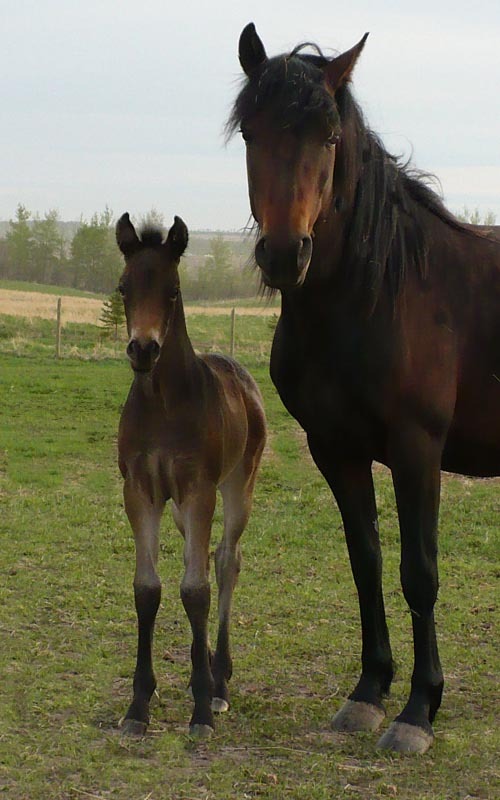 2J BRASS PRINCESS (KRP Cocoa X 2J Willy's High Five), 2004 buckskin filly bred by 2J Morgans, Alberta Canada. 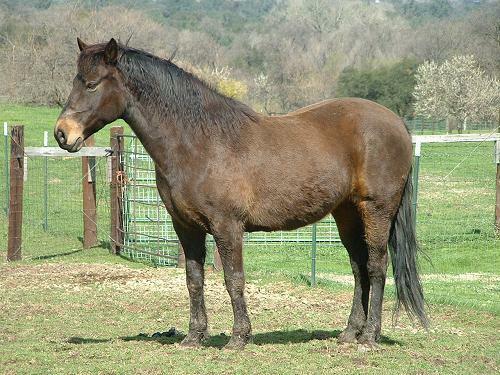 SPRINGTOWN LAUREL (Richfield Octavius, brown buckskin X Rose Hill Pistachio), 1993 buckskin mare. Laurel looks like a non-dilute dark bay or brown. 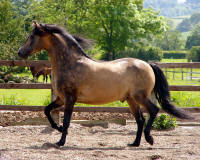 Testing proved she has both the cream and agouti genes, which means she is a dark bay or brown-based buckskin. Owned by Lorna Odegard of San Diego, CA. Photo by Lisa Horning. SELAH ELISHA KAY (Robbi Sue's Mr. Alert X Caylyn Bold As Brass), 2004 buckskin filly owned by Jennifer Boswell. Most buckskin foals, like bay foals, are not born with fully pointed lower legs; the black points begin to show as the foal sheds its foal coat. Photo courtesy of Cindy Taylor. The late PKR PRIMAVERA BRIO (Primavera Valdez X Rose Hill LaPapillion), 1994 buckskin stallion owned by John Hutcheson, Gab Creek Morgans, Dahlonega GA. Photo by Laura Behning. R-TWO FLYING BUCKAROO (Sunup Neptune X Plainsview Firefly), 1997 buckskin stallion owned by Ken and Ruth Plank of KRP Morgans, Nappanee IN. 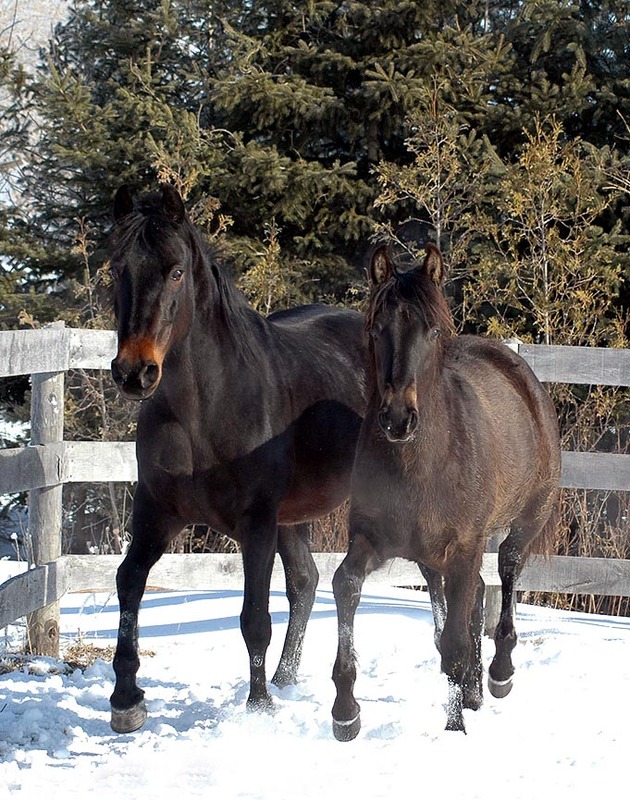 UCM VIMY RIDGE, 2002 buckskin colt bred by Upper Canada Morgans, Gord and Mary Freeman, St. Thomas, Ontario, Canada, with his 1994 palomino dam M & M K'EHLEYR SUPRISE (Shatona Karzan X Contessa). 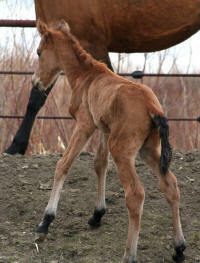 Vimy's sire is KRP Amigo Dan De (Sunup Neptune X Hot Fudge Swirl). Vimy is now owned by Gail Mactavish. 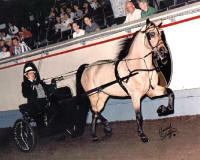 MONTANA HARVEST (Triple S Red Cedar X Tia Margarita), 1992 buckskin stallion, shown here at Breyerfest 2001 (held at the Kentucky Horse Park in Lexington) where he was a Guest Horse. Breyer made a model of "Buckshot" in 2001. Trainer Thom Lindley is holding Buckshot and a young fan is aboard the stallion. CJ SPARKLING GEM (World's Edge Goldoak X Chuckey Crown Jewel) 1994 buckskin gelding owned by Jackie Wyandt, Arenzville IL. 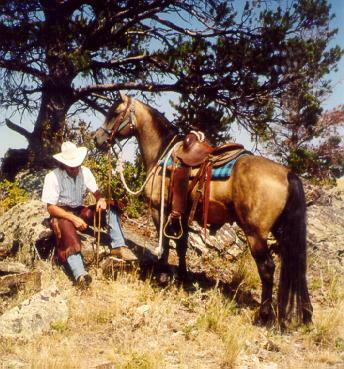 BUTTER RUM (Sunup Neptune X Dove's Sencerely), 1995 buckskin gelding bred/photographed by Anita Gallion. 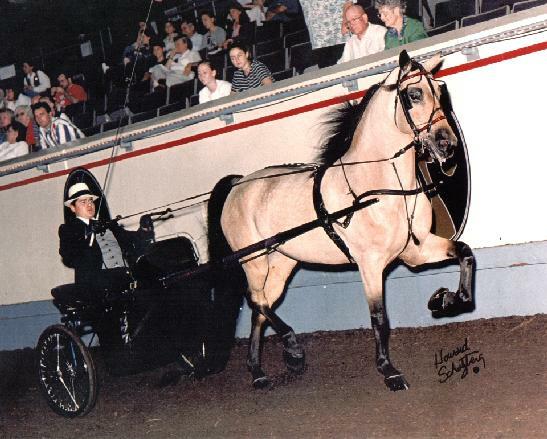 The late KENNEBEC OPAL (Californio X Kennebec Lucille) 1981 buckskin mare owned by Margaret Gardiner of Woolrich, ME. Pictured here in 1989 at Groton House Horse Trials in show jumping. 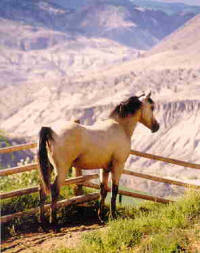 Her son Kennebec Golden Legacy is pictured on the palomino page; one of her buckskin daughters, Kennebec Topaz, can be seen elsewhere on this page, as well as on her own page here. LJ MORNING REVEILLE (Sunup Neptune X High Ridge Victoria), 1990 buckskin stallion owned by Tindo Morgans, Thrall TX. 2J SUN HAWK (KRP Cocoa X High and Mighty Maxine), 1996 buckskin gelding owned by Audrey Williams, Clinton BC Canada.